Kyrgyzstan's parliament on Thursday passed a law that will make it easier to prosecute former presidents as a rivalry between the country's former and present leaders threatens a new political crisis. The impoverished Central Asian country of six million, which hosts a Russian military base, saw consecutive presidents overthrown in 2005 and 2010, with a wave of deadly ethnic violence following the second uprising. Under the amendments to the law on "guarantees of the activities of the President of the Kyrgyz Republic", a president can be jailed for crimes committed while in office after he or she steps down. 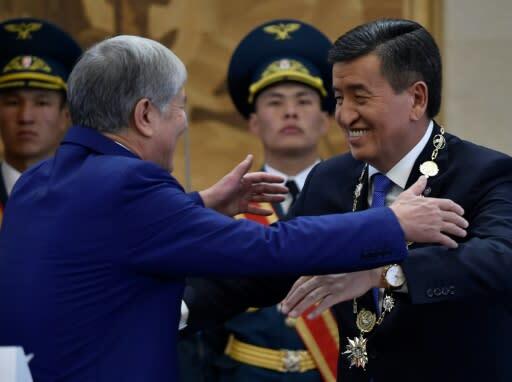 The law, which was opposed by only three lawmakers, is seen as a move to pile pressure on the country's former president Almazbek Atambayev who has been openly critical of incumbent and former ally Sooronbai Jeenbekov. The relationship between Atambayev and Jeenbekov collapsed just months after Jeenbekov's inauguration in 2017. The standoff between the pair has prompted fears over stability in a country that is surrounded by authoritarian neighbours and remains a corridor for drugs trafficked from Afghanistan. Atambayev, the first elected Kyrgyz leader to see out a full term in office, was unable to run in the race because of a constitutional clause that limits presidents to a single six-year term. He has pledged to lead his Social Democratic Party of Kyrgyzstan -- the country's largest political party -- to parliamentary elections set for 2020. Jeenbekov's brother Asylbek Jeenbekov, an influential lawmaker, quit the Social Democratic Party of Kyrgyzstan on Wednesday, complaining of Atambayev's "dictatorship" over the party. Atambayev's spokeswoman declared SDPK an opposition force last month despite the fact the party is represented in the ruling coalition, while the bulk of SDPK lawmakers remain loyal to the president.